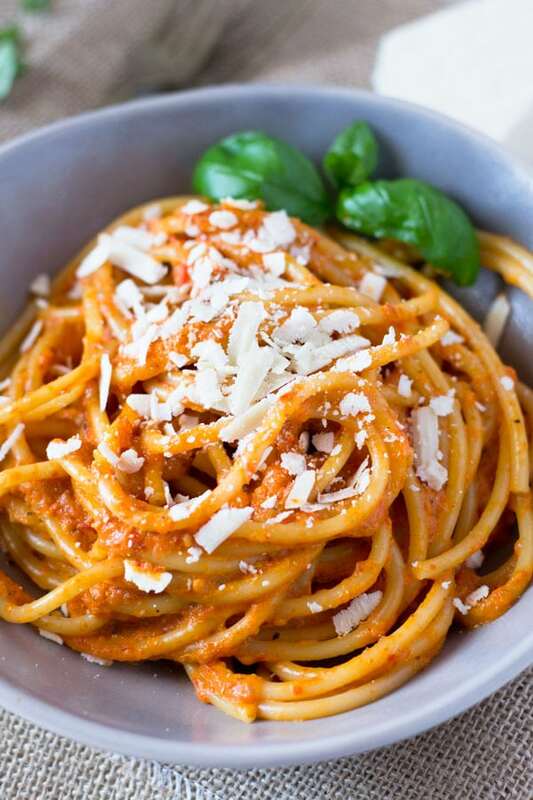 Bucatini pasta is tossed through a delicious tomato and roasted red pepper cream sauce made with garlic, red onion, oregano, and mascarpone then topped with shavings of ricotta salata. This roasted red pepper cream sauce has many uses, I love it with chicken meatballs and polenta or with gnocchi. Today’s recipe uses this thick, rich and delicious sauce to coat bucatini pasta and it’s insanely good! 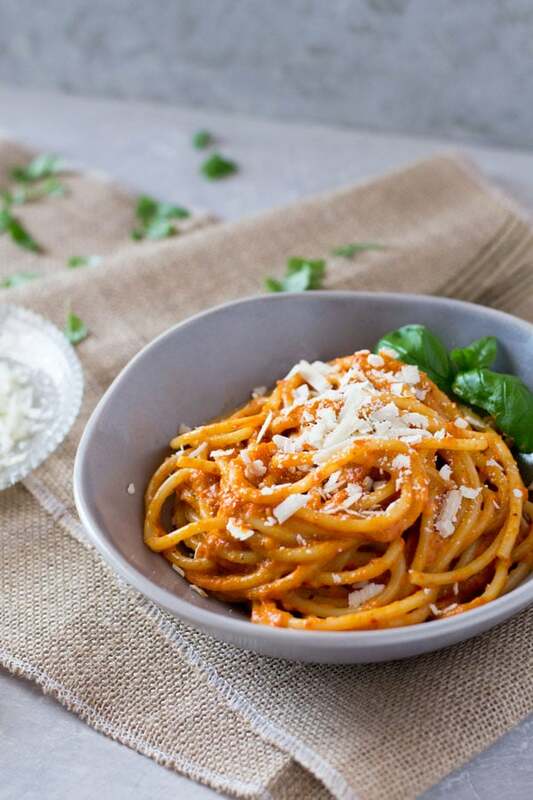 Bucatini is very similar to spaghetti except it’s much thicker and is hollow, they’re like thick spaghetti tubes and they such up all the delicious pasta sauce. If you know me, you’ll know I love a big bowl of pasta…I mean why else would I have moved to Italy? Sure, I can’t complain about the weather, although I do sometimes ‘oh it’s soo hot, I can’t go anywhere without turning into a puddle and my makeup melting off my face’. I’m then quickly reminded that I’m from Scotland and to be quiet. But the real reason I’m here is, of course, the FOOD. I’m completely and utterly obsessed with Italian food and living in this beautiful country is such a dream for me. I get to eat my big bowls of pasta al fresco in my garden, staring at the beautiful vineyards and olive trees. So let talk about the yummy details, this is sauce is quite sweet from the roasted peppers which is why I love to add ricotta salata on top to balance the flavours. Ricotta salata is salted and dried ricotta cheese, it’s a hard cheese that’s shaved or grated and it’s so perfect over many pasta dishes, you should be able to find it in an Italian specialty food store. It goes so well with this bucatini with roasted red pepper cream sauce because of it’s sweet flavours, the salty ricotta adds a punch of flavour. The sauce is incredibly simple to make, red peppers, cherry tomatoes, red onion and garlic are roasted with some oregano, salt and pepper until soft and juicy. It’s then all blended in a food processor with a tablespoon of mascarpone to add a cheesy, creaminess. Once the bucatini is cooked al dente the sauce is then poured over and it’s tossed until completely coated. Serve in bowls and grate over the ricotta salata. Delish! Preheat the oven to 180°C/350F/gas mark 4. Quarter the red peppers removing the seeds and stalk, roughly chop the onion and slice the tomatoes in half. Add to a large baking tray and sprinkle over the oregano, salt, and pepper. Add the garlic cloves, skins still on and drizzle with olive oil, toss so everything is coated in oil. Roast for 25-30 minutes until cooked through, juicy and blackened ever so slightly. Bring a pot of salted water to a boil and cook the bucatini pasta until al dente. Once the veg is cooked, remove from the oven. Remove the garlic from their skins and discard the skins. Add everything to food processor with a tbsp of mascarpone and blitz to a smooth sauce. Taste for seasoning and add more salt if needed. Pour the sauce over the cooked and drained pasta and toss until thoroughly coated. Serve in bowls and top with some grated ricotta salata. Please note this recipe has been tested and developed using metric measurements all imperial measurements are approximate. It sais 1 red onion in the ingredients section but doesnt say what to do with it? Making it right now! Ooops sorry about that Chelsey, I just updated the recipe. The onion is cut up and roasted with the pepper and tomatoes then blended. Hope you enjoyed it! Thanks so much Sue, it’s such a great pasta I love it too. 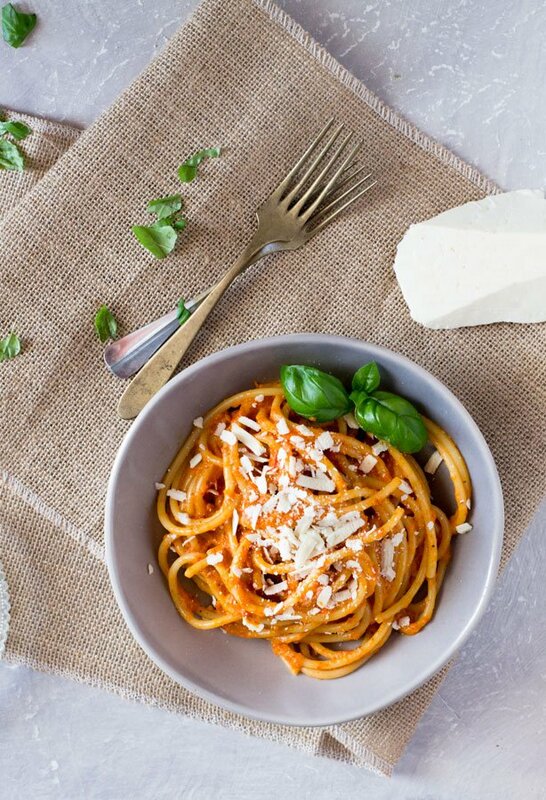 I always love pasta with a red pepper sauce…probably my favorite. Can’t wait to give this a try – it sounds amazing!! Thank you Sarah, I hope you enjoy! I love a bucatini noodle – one of my favorites! this sauce sounds so flavorful and … comforting! yum! Thanks Kristina, bucatini is so yummy! I think bucatini is one of my favorite pastas. It just feels more substantial to me than spaghetti. Why is that? Roasted red pepper cream sauce is calling my name, too! It sounds amazing! Thanks so much Lisa, maybe because it’s thicker even although it’s hollow. You are living my ideal life – eating pasta in the garden every night – vineyards to keep your eyes company. Bliss. I love Italian food because it’s so straightforward, more or less wholesome and some damn tasty. This pasta and sauce is just wonderful. Thanks so much Jane, I realised how lucky I am to be living here whilst writing that post…even although it’s been REALLY hard! This looks right up my alley! The lovely pasta, and that sauce – I love putting mascarpone in, well, anything, haha, but especially pasta sauces. Pinning this to try very soon! Thanks so much, I hope you enjoy. Haha yes, I looove mascarpone too! Sounds delicious. Love the combination of mascarpone with red peppers. This looks like some beautiful and delicious comfort right here! Thanks so much Hannah, it’s total comfort food without being heavy, nice and light for summer! 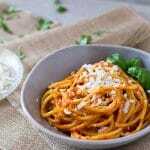 I love roasted pepper, this bucatini looks so yummy!